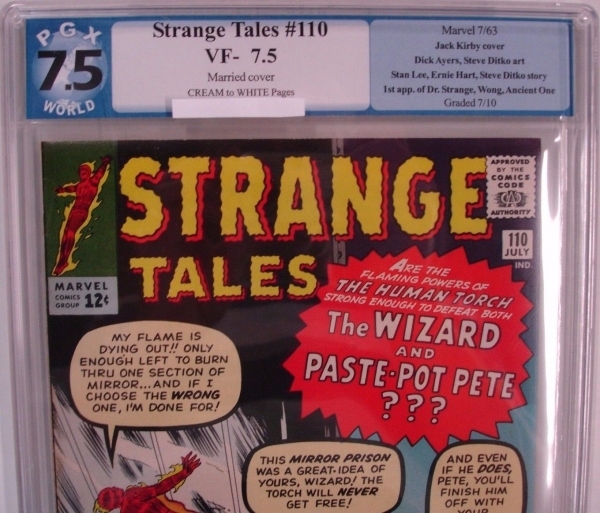 This sale is for 1 Strange Tales #110 PGX 7.5 published by Marvel Comics in 1963. This Silver Age MEGA KEY showcases the 1st appearance of Dr. Strange and is the hottest book on the market hands down. With the movie coming soon this is a safe investment no doubt! The case is in great shape and has some minor surface wear. Item will ship worldwide via expedited delivery insured with signature required. Be sure to check out my other comics and collectibles at the sellers other items link and treat yourself to other great items. All comics are shipped with GREAT CARE in boxes and are bubble wrapped for protection. Each picture is a high quality scan of the ACTUAL COMIC you are bidding on. All International buyers are responsible for paying any Customs fees / International Import taxes / Brokerage fees or other expenses associated with their purchase. All items will be shipped as merchandise only.